If you haven’t read about the concussion class action, here’s a link to a great blog prepared by a lawyer which is updated regularly devoted strictly to the topic. Recently,the NFL and the players agreed to a $765 million settlement for any and all claims. That sounds like a lot of money. If there are 4,500 players in the class, and all settlements and injuries are treated equally, that works out to around $170,000 per player. This figure also does not include legal fees. Does that still sound like a lot of money? It doesn’t to me, but I think that the players had a very difficult claim in the circumstances. I have no doubt that playing the sport of professional football, you’re putting your brain/head at risk of injury. If your brain weren’t at risk, then why wear the helmets and all the other equipment? I’ve never been privy to a private NFL practice back in the 1980’s or 70’s, but I’m sure that player safety was pretty low on the list for coaches, managers, and even players alike. Nobody gave much thought to the nature or long term effects of brain injury. Players were expected to be tough, and to fight through the pain. If they wanted to sit out, they risked losing their jobs on the field to other players, and then were percived as “soft” or not team players. Coaches were expected to get the most out of their players and work them hard on the practice field. If coaches didn’t work their players hard, and they weren’t getting the results they wanted during the games, it was their job on the line. The real question is one of damages and causation. Can all of the players prove their brain injuries in open court (which is difficult to do in many cases because brain injury is largely an invisible injury and the associated problems such as memory loss, impaired concentration, anxiety and depression, are largely subjective in nature). If the players can prove their brain injury to the Court, then can they prove that playing or participating in NFL football caused or contributed to that brain injury and associated damages. This concept is called “causation” in the law. It’s a tricky one to prove in a case such as this. In a car accident case, causation can be difficult as well when there are no objective injuries. But, when there are objective injuries, it’s not as difficult. A drunk driver ran hit my motorcycle. As a result of the collision, I broke my leg. The broken leg was caused by the drunk driver. Voila! Causation. In the case of the NFL players concussion lawsuit, causation was very difficult to establish. Did playing in the NFL lead to these brain injuries? Or, was it playing football since the players were very young at all levels (Pop Warner Football, High School Football, College Football, Pro Football in other leagues etc.). Did a previous trauma to the head unrelated to NFL football cause the brain injury such as a slip and fall, motorcycle accident, car accident, or a bar fight? Did the abuse of alcohol or other illegal drugs contribute to the depression, anxiety or mood disorders for which the players are seeking damages for? Establishing that these brain injuries were caused solely as a result of playing NFL football must have been very difficult to establish. Then, the factor of volenti comes in to play. All of the players knew that football was a violent, fierce, physically intense and dangerous sport. Every time they put on their uniforms, they were putting their bodies at risk. When you voluntarily assume the risk of an activity, you must be held accountable for part of the blame if an injury results from that activity. Think bungee jumping, rock climbing without a harness, or whitewater rafting. All are dangerous activities. If you participate in any of these activities through a group/company, I assure you that you’ll have to sign a release or waiver absolving the organizer from any and all liability associated with that activity. You knew what you were getting in to and the risk associated there in. So, if you voluntarily assumed that risk, you cannot hold another accountable for your injury. The same can be argued that the NFL players voluntarily assumed that risk of playing in and participating in a dangerous sport in which head injuries were a known occupational hazard. But, the similarities with these 4,500 class members were uncanny and couldn’t be overlooked. All of their sympamolgy was alike. Their previous behaviours and patterns were too similar to be a coincidence. The NFL agreed to settle for $765 Million. That tells me one of two things. Either the NFL had something big to hide or that they have a genius PR and legal team behind them. Had this case gone to trial, or dragged on longer, the NFL would have looked bad and it may have compromised their on-field product. That would cost the NFL even more money. By settling, now the NFL can go on with business as usual and continue to roll on the dough. The NFL is also much more cautious in dealing with concussions and player safety issues. So, if another group of players comes out of the word work following those new safety protocols; the league can just point to those procedures and say that they did eveything they could to protect their players from brain injury. In addition, had the NFL lost, it would have set a very dangerous precedent not only for them and how they run their league, but for other professional sporting leagues as well. Hockey might have the same issue as the NFL. Either way, following the lawsuit was very interested for the personal injury bar, sports fans and the general public alike. 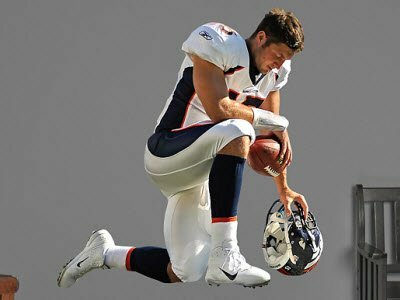 You must be wondering..why all the pics of Tim Tebow Tebowing? There can NEVER be enough Tebow for the Goldfinger Injury Lawyers Blog. Never.